World Library and Information Congress: 84th IFLA General Conference and Assembly, Kuala Lumpur, Malaysia. Session 138: Marrakesh Treaty in force: The Role of libraries. Rafiq (30) and his son Issam (6) are new in the country: Presentation by Stijn Callewaert, Netwerk Brusselse bibliotheken (Brussels Public Library Network). Lucas (10) has dyslexia, Maddy (78) has a deteriorating eyesight, Bart (42) is blind …Saskia Boets draws conclusions from the presentations and reflects on the necessity of specific guidelines for library services. World Library and Information Congress: 83th IFLA General Conference and Assembly, Wroclaw, Poland. The objective is to bring together relevant stakeholders from Egyptian Library and VI communities and appropriate Government, Parliamentary and Legislative Leaders to identify Egyptian Solutions to the Book Famine. World Library and Information Congress: 82th IFLA General Conference and Assembly, Columbus, USA. Satellite meeting: Tailoring the Reading Experience to Meet Individual Needs, Louisville, Kentucky, USA. August 11-12, 2016. World Library and Information Congress: 81th IFLA General Conference and Assembly, Cape Town, South Africa. 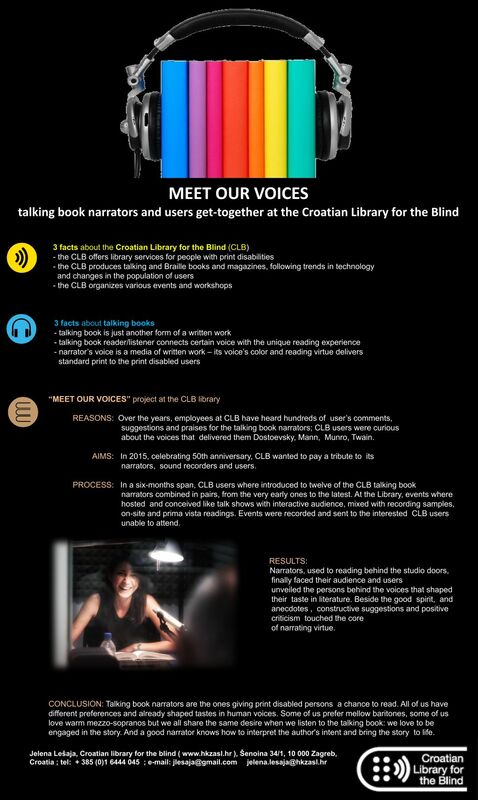 Title: The inclusive library: How to render inclusive library services to blind and visually impaired people. World Library and Information Congress: 80th IFLA General Conference and Assembly, Lyon, France. World Library and Information Congress: 79th IFLA General Conference and Assembly, Singapore. Theme: "Future Libraries: Infinite Possibilities"
LPD Standing Committee meetings: Saturday 17 August, 9:45 - 12.15 and Tuesday 20 August, 16:45 - 18:15. LPD Session program on Saturday 20 August 11:45 - 13:45: "Search, find and read: three steps to access; what has the future library to offer the print disabled? — Libraries Serving Persons with Print Disabilities"
LPD Session: “The right to read” - How to include excluded citizens in the knowledge society? August 17–20, 2009 Belgium and Netherlands.